Lighted jewelry displays are the perfect way to exhibit jewelry items with class. These displays vary from small ring boxes to bigger versions. They are equipped with built-in lights that will beautifully shine upon its contents and therefore present them in an attractive and interesting manner. They are great for displaying jewelry in stores’ window cases as they are sure to catch any passerby’s eyes. The lights’ effect offers the jewelry pieces a glamorous and dashing look and enhance their qualities. The light can be warm, neon, multicolored and so on. This kind of displays belong in a window store or anywhere they can be readily admired. They are suited for rings, brooches, earrings, bracelets and they can also be used at home. Their main target is to shed more light and attention upon the items of jewelry they are displaying and to beautifully show them off before anyone. The lights can go on or they can flicker intermittently at your choice. 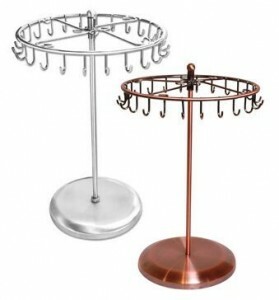 Jewelry spinner displays offer a fun and entertaining, but also efficient manner of displaying jewelry. They are meant display pieces of jewelry by showing off every angle for a better and improved view. They vary in form, color and size so they come in a wide range of patterns and style. They are great for jewelry window stores as they continuously spin, thus captivating anyone’s attention. Their aim is to both offer a show and also elegantly exhibit the traits of various jewelry items. They are a nice touch in any jewelry collection display. Jewelry spinner display can be used to highlight rings, pairs of earrings, bracelets, necklaces etc. Their concept is versatile and captivating and an attractive way of decorating the interior of a jewelry store. They are ideal for a more entertaining and more lively display of jewelry than the same old fashioned jewelry display methods. Musical jewelry displays offer a delicate and unique way of presenting jewelry with the help of music. 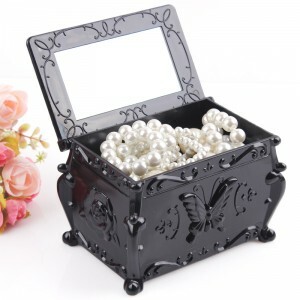 Most musical jewelry displays are boxes that start to sing whenever they are opened. They provide an elegant and sophisticated combination between the display of items of jewelry and music. They are available in various shapes, colors and sizes. They represent a great and really fancy manner of displaying your jewelry and while they wouldn’t be heard in a jewelry department store’s window, they can be placed around the store for a better and more long lasting effect on the clients, thus creating a pleasant atmosphere as well. Furthermore, they are perfect for your own use at home as well. This kind of display will beautify any window case with multiple enticing tunes. Its goal is to exhibit and store jewelry items in an innovative and dynamic way that will attract anyone’s attention. Stackable jewelry displays are a great and efficient method of display and organizing jewelry. 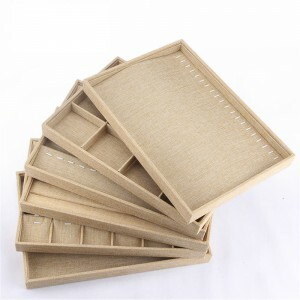 They are square shaped trays with numerous smaller slots that can store plenty of jewelry items. They are usually made of sackcloth, metal and even plastic. They come in many sizes and they can be easily arranged everywhere. They require no effort when transporting and prove very useful at keeping jewelry items from getting tangled into each other. They will fit perfectly in any jewelry window case or inside the store, as they can be used for multiple and imaginative ways of presenting jewelry sets before the clients. They make the organizing and transporting of jewelry sets also much more easier and they can also be used for your personal use. Stackable jewelry displays are ideal for exhibiting pieces of jewelry in new and interesting ways and they will beautifully decorate the windows of jewelry stores. Tiered jewelry displays are elegant and chic items that will display jewelry sets in a very classy and stylish way. They contain from one to three and even more tiers and they are usually made of fine leatherette – that is soft and very smooth to touch – or plastic. They are supported by a strong stand and they are available in multiple colors and sizes. Tiered displays are perfect among bigger items of jewelry exhibition. They can accommodate bracelets, arm bracelets, watches, pairs of earrings and so on. They are the perfect addition to any jewelry display case and any jewelry item will be proudly displayed. They can also easily decorate the rest of the store or the interior of your own home. These tiered displays come in very handy and they are very efficient at keeping jewelry pieces always on sight and within reach. They are also light and easy to carry. Folding jewelry displays are a gorgeous and exquisite manner of exhibiting jewelry products. They are usually three-pieced and they are large enough to accommodate entire collections of jewelry. They stand upright and are constructed with strong metal. They often present beautiful and intricate patterns and various ways of hanging and displaying jewelry items. They are great for background display or as the main item of decoration and they can be easily placed in the corners of the display window or the store. They are equipped with a great number of hooks and holes of diverse sizes that will definitely attract anyone’s attention. Folding jewelry displays are a highly elegant and sophisticated way of displaying jewelry both at home or in specialized venues. Their intricate design is stylish, chic and they often present attractive and stunning metalwork. They are definitely perfect for displaying jewelry items in any jewelry store’s window case. 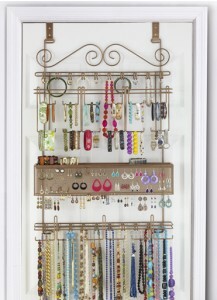 Adjustable jewelry displays are a very efficient and helpful way of hanging and displaying jewelry. They come in various sizes and colors. They are made of strong plastic material or metal. The stands are usually supported by a tray that allows room for more items as well. These products can come in very handy when setting up a jewelry exhibition in a jewelry window display or store. Adjustable jewelry displays can have either one, two three or more bars, each one of them equipped with hooks or support for jewelry items. Rings, pairs of earrings, brooches, bracelets and so on. Moreover, their bars are easily and very conveniently adjusted to fit various kinds of jewelry as well and they can be used in your home just as well. This kind of display is very convenient space-wise as it does not take up much space and they can fit pretty much in any crowded window case! This type of display will prove to be very helpful when arranging jewelry shops; they can be easily put up against any flat surface, wall, door, cabinet doors etc., therefore saving up a lot of valuable space. 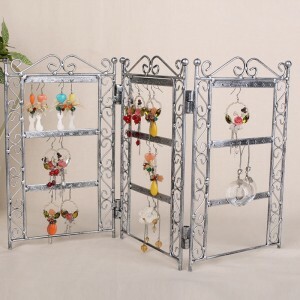 Hanging jewelry displays are meant to store and display a large number of jewelry items. They are usually made of non-woven material or plastic. They offer diverse ways of hanging and displaying jewelry and they can be accommodated in any window display case. They are either provided with pockets for jewelry display or holes and hooks to hang jewelry onto. They have various shapes, colors and sized but they are all elegant and efficient when displaying pieces of jewelry. 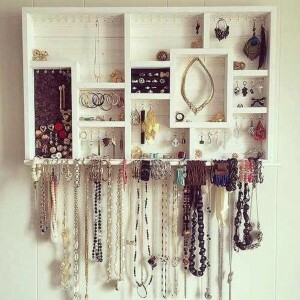 Hanging jewelry displays can be used at home just as well. Any store’s window case or wall will look more complete yet not too overcrowded with the help of this kind of jewelry display. Rotating jewelry displays are a great alternative for regular cases as they are very practical and offer a great economy of space. Depending on what kind of items you intend to showcase, they come in many shapes and sizes and they vary in capacity. In most cases, rotating jewelry displays showcase watches, due to their ability to exhibit a large number of items, each of them being individually the “main focus” of the stand. Some different rotating jewelry displays include wood and metal tiered displays, pilfer-proof shelf displays and rotating carded jewelry displays. Some rotating jewelry displays include battery turntable displays, rotating collector’s cases, lazy susan turntables and rotating light bases. Displays for jewelry, rotating towers and rotating racks are additional types of rotating displays. Rotating jewelry displays are one of the most eye-catching visual merchansing tools as they often act like a centerpiece in various showcasing circumstances. An important aspect that every merchandiser should consider when setting up a rotating display is that they give you the opportunity of strategically putting an item in the center of attention. From wedding rings and earrings to watches and any other type of jewelry, you name it, they will look stunning showcased in a rotating jewelry display and that is no coincidence. Many rotating jewelry displays feature lighting capacities that are specially designed for highlighting the true sparkle of a jewel. Your customers should always be able to see and appreciate the delicate details, cuts and textures of the items they intend to purchase. This type of display is absolutely essential if you are a jewelry retailer. Either you own a big or small shop, you will definitely need to protect your belongings. And the lockable displays are ideal for that. Made entirely out of transparent glass, they allow you to organize and visually present the jewelry pieces while keeping them under the lock, discretely mounted on the bottom half. Not only do they keep the valuables out of potential curious’ reach but also liquids, dust or humidity are kept at distance as well. They also have a great capacity of storage, being capable of storing anything, from voluminous watches to rings and other modest sized jewels. Adding the right lighting is essential so make sure you use the display to its full potential. What is the first thing a client does after trying on a pair of earrings? She demands a mirror to admire them and how they flatter her, of course. So why not making her task and yours as well? The answer is the mirrored displays. Ideal for mounted displays, stands or rotating displays, or more precisely for those which exhibit jewels like necklaces or earrings. Very practical, these types of mirrored display will allow your potential clients to try on jewelry easily and saving a lot of time, helping them to decide quicker on what to buy. Being a jewel retailer implies travelling, and quite a lot if you think about it. And you know that when a show or a market takes place, you cannot take the whole shop with you. These are the times when portable displays step up to give you a hand. They are generally made out of wood, as it is a pretty light but also a very resistant material, but plastic and metal is also common. Portables are basically stands that you can take everywhere you go. Inside, they have a multitude of departments, so they give you the freedom to take any type of jewelry with you. But try to avoid small and fragile pieces as they not be very safe in these. Portables are ideal for loose necklaces and bracelets as they can be admired the best. They will make the whole procedure of displaying effortless and attractive. This type of jewelry display is dedicated to the smaller portion of the jewelry pieces, more specifically to rings and fine bracelets. They are the classical “proposal” type of case, which lifts up and inside there is a velvet or silk covered slot where you insert your jewel. They are very beautiful and classy and look perfectly in glass or other transparent shop window. They combine the aesthetic with the practicability, as they can be offered as they come, as a gift, already nicely wrapped. Modular jewelry displays are a special and sophisticated way of displaying jewelry. They contain spacious glass cases and are usually constructed with alloy tubes or clear-cut glass. They offer a simplistic yet elegant display and they are able to accommodate plenty of jewelry sets. The glass is entirely see-through so any item can be admired clearly. They are equipped with many glass shelves that will readily organize items of jewelry and they usually present interesting geometrical shapes. Modular displays are ideal for the display of jewelry in specialized jewelry stores as they offer a touch of elegance and finesse. They are very convenient as they do not take up much space and they succeed in displaying a large number of jewelry. Modular jewelry displays are the perfect choice for any store who wishes to display their products in a fashionable and chic manner without making their store look too overcrowded. Wall mounted displays are a wonderful way of displaying, organizing and storying entire collections of jewelry while also beautifully decorating any environment. They are ideal for both personal use or in jewelry stores. They come in a variety of shapes, models and sizes and they are gorgeous and appealing pieces of decoration that will attract anyone’s attention. They are usually made of durable material, such as metal, and they are very resistant and sturdy. They display jewelry in a very diverse manner as they have many kinds of pockets, shelves, hooks in order to exhibit items of jewelry in a more unique and special way. They are definitely an amazing choice for embellishing any jewelry store but they are just as fit and useful when being used home. They are rather easy to put up against the wall and they surely don’t disappoint when it comes to displaying all kinds of jewelry! Interlocking jewelry displays are an amazing and highly efficient manner of displaying plenty of jewelry items. They contain numerous kinds of drawers and they are able to accommodate an entire collection of jewelry. They are usually made of acrylic that is completely see-through, therefore allowing a clear look at the items. They provide slide-out shelves of various sizes that are perfect for pairs of earrings, rings, bracelets, necklaces and so on. Interlocking jewelry displays are the best way of presenting jewelry given their transparent nature and they also save up a lot of space, so they will not make any jewelry window case look too overcrowded. They are preferable and convenient in any jewelry store as they can be placed pretty much anywhere, so the pieces of jewelry can always be admired by passersby. They are stylish, modern looking and provide a clear and perfect look at any jewelry item. In display case displays are ideal for displaying jewelry in a more special and fancy way. They present jewelry items in an in-cased display that makes them look unique and individualizes them. They come in various shapes, especially rectangular, and they can be of various sizes; they can either be simple, containing one cased display or a complete set of them. They are beautifully framed and they can be easily hung on a wall. They make for gorgeous and one of a kind items of decoration and they can be placed pretty much anywhere! This kind of display presents jewelry as if they were highly important awards or trophies, therefore attracting wanted attention towards them. They are perfect for home use as well. In display case displays can be a nice finishing touch in an exhibition set or they can present an entire collection of jewelry themselves, depending on their size and style. Over-the-door jewelry displays are probably one of the best time and space saving way of displaying and organizing jewelry. They take up almost no place and they are especially designed to accommodate a wide range of jewelry and even more than just jewelry. Most over the door displays are rectangularly shaped and they are equipped with large windows that can prove to be very useful. This kind of display is ideal for any bedroom or living room, but they can be just as well used in a specialized jewelry store. They are all very elegant and they offer a beautiful and attractive way of keeping your entire jewelry collection in one place and beautifully displayed before anyone. You will never have to worry about misplacing your jewelry or your beautiful trinkets taking up too much space in your drawers with the help of this wonderful product as they are very efficient and useful. Stackable displays are a beautiful and appealing manner of displaying jewelry. They are both efficient in storing and organizing them and also in presenting them before anyone else. They usually contain multiple mobile trays that can be folded or unfolded. Stackable can also be very useful when transporting items of jewelry. They offer an interesting and unique display mechanism and they can accommodate a considerable number of items of jewelry. They are usually divided into more trays that contain a large number of pads that will beautifully display pairs of earrings, rings, bracelets, brooches, and so on and so forth. Stackable are ideal when displaying a bigger collection of jewelry since they are also very space efficient as well. They can be placed in any corner of the store or they can be utilized for your personal use as well. Stackable displays are a very efficient and elegant way of display jewelry that will avoid making any window case look too overcrowded.